In Service Fabric, a service runs somewhere in a Service Fabric cluster, typically distributed across multiple VMs. It can be moved from one place to another, either by the service owner, or automatically by Service Fabric. Services are not statically tied to a particular machine or address. A Service Fabric application is generally composed of many different services, where each service performs a specialized task. These services may communicate with each other to form a complete function, such as rendering different parts of a web application. There are also client applications that connect to and communicate with services. This document discusses how to set up communication with and between your services in Service Fabric. Service Fabric helps manage the lifecycle of your services but it does not make decisions about what your services do. This includes communication. When your service is opened by Service Fabric, that's your service's opportunity to set up an endpoint for incoming requests, using whatever protocol or communication stack you want. Your service will listen on a normal IP:port address using any addressing scheme, such as a URI. Multiple service instances or replicas may share a host process, in which case they will either need to use different ports or use a port-sharing mechanism, such as the http.sys kernel driver in Windows. In either case, each service instance or replica in a host process must be uniquely addressable. In a distributed system, services may move from one machine to another over time. This can happen for various reasons, including resource balancing, upgrades, failovers, or scale-out. This means service endpoint addresses change as the service moves to nodes with different IP addresses, and may open on different ports if the service uses a dynamically selected port. Service Fabric provides a discovery and resolution service called the Naming Service. The Naming Service maintains a table that maps named service instances to the endpoint addresses they listen on. All named service instances in Service Fabric have unique names represented as URIs, for example, "fabric:/MyApplication/MyService". The name of the service does not change over the lifetime of the service, it's only the endpoint addresses that can change when services move. This is analogous to websites that have constant URLs but where the IP address may change. And similar to DNS on the web, which resolves website URLs to IP addresses, Service Fabric has a registrar that maps service names to their endpoint address. Resolve: Get the endpoint that a service has published from the Naming Service. Connect: Connect to the service over whatever protocol it uses on that endpoint. Retry: A connection attempt may fail for any number of reasons, for example if the service has moved since the last time the endpoint address was resolved. In that case, the preceding resolve and connect steps need to be retried, and this cycle is repeated until the connection succeeds. Services connecting to each other inside a cluster generally can directly access the endpoints of other services because the nodes in a cluster are on the same local network. To make is easier to connect between services, Service Fabric provides additional services that use the Naming Service. A DNS service and a reverse proxy service. Since many services, especially containerized services, can have an existing URL name, being able to resolve these using the standard DNS protocol (rather than the Naming Service protocol) is very convenient, especially in application "lift and shift" scenarios. This is exactly what the DNS service does. It enables you to map DNS names to a service name and hence resolve endpoint IP addresses. As shown in the following diagram, the DNS service, running in the Service Fabric cluster, maps DNS names to service names which are then resolved by the Naming Service to return the endpoint addresses to connect to. The DNS name for the service is provided at the time of creation. 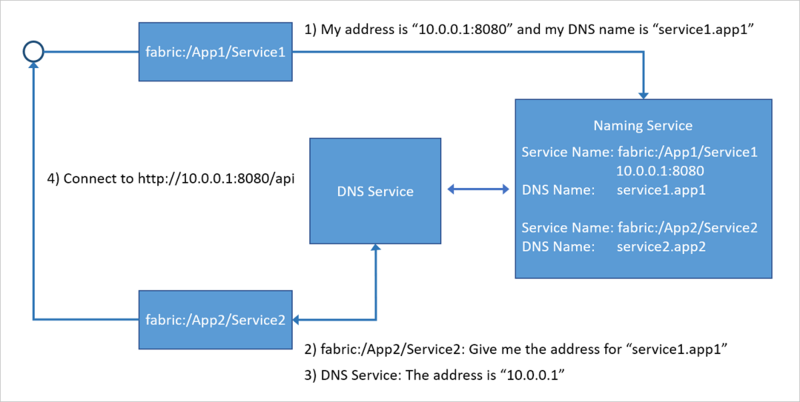 For more details on how to use the DNS service see DNS service in Azure Service Fabric article. The reverse proxy addresses services in the cluster that exposes HTTP endpoints including HTTPS. The reverse proxy greatly simplifies calling other services and their methods by having a specific URI format and handles the resolve, connect, retry steps required for one service to communicate with another using the Naming Service. In other words, it hides the Naming Service from you when calling other services by making this as simple as calling a URL. 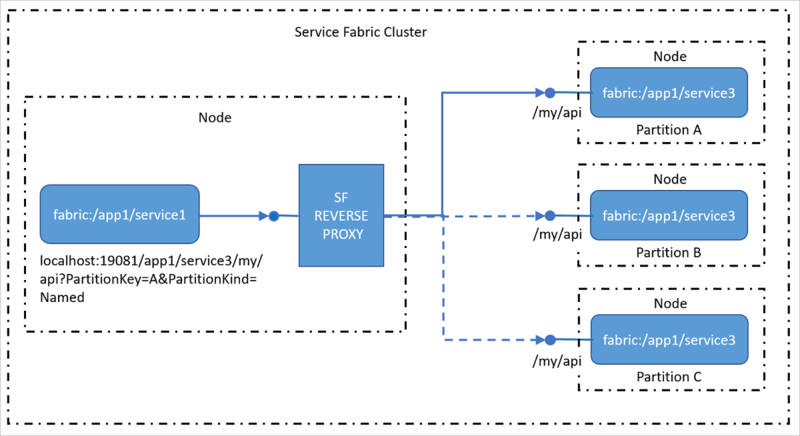 For more details on how to use the reverse proxy service see Reverse proxy in Azure Service Fabric article. Services connecting to each other inside a cluster generally can directly access the endpoints of other services because the nodes in a cluster are on the same local network. In some environments, however, a cluster may be behind a load balancer that routes external ingress traffic through a limited set of ports. In these cases, services can still communicate with each other and resolve addresses using the Naming Service, but extra steps must be taken to allow external clients to connect to services. 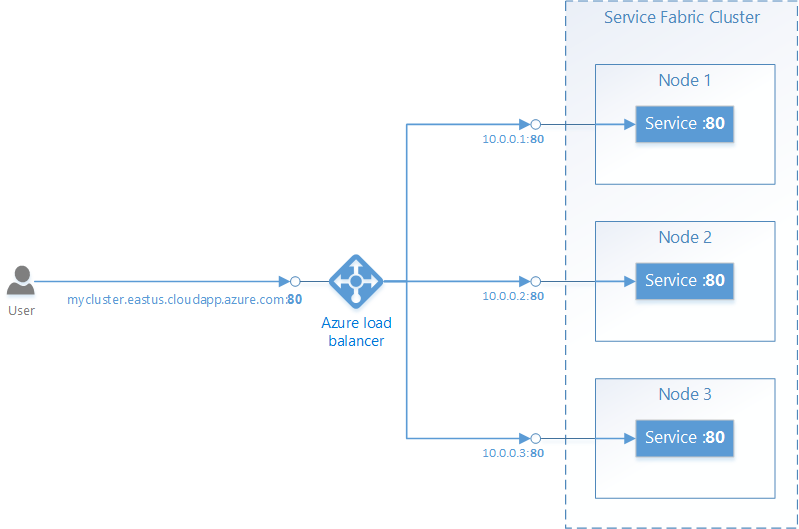 A Service Fabric cluster in Azure is placed behind an Azure Load Balancer. All external traffic to the cluster must pass through the load balancer. The load balancer will automatically forward traffic inbound on a given port to a random node that has the same port open. The Azure Load Balancer only knows about ports open on the nodes, it does not know about ports open by individual services. Write a service that listens on port 80. Configure port 80 in the service's ServiceManifest.xml and open a listener in the service, for example, a self-hosted web server. 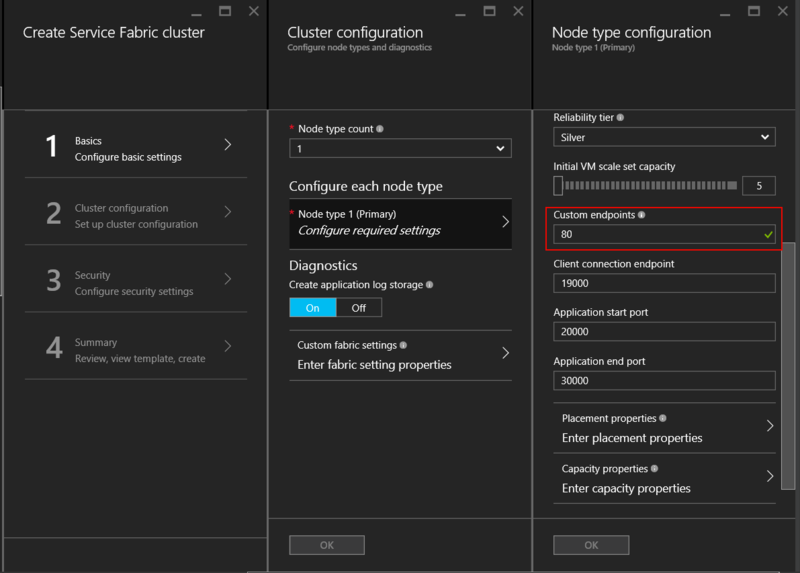 Create a Service Fabric Cluster in Azure and specify port 80 as a custom endpoint port for the node type that will host the service. If you have more than one node type, you can set up a placement constraint on the service to ensure it only runs on the node type that has the custom endpoint port opened. Once the cluster has been created, configure the Azure Load Balancer in the cluster's Resource Group to forward traffic on port 80. When creating a cluster through the Azure portal, this is set up automatically for each custom endpoint port that was configured. The Azure Load Balancer uses a probe to determine whether or not to send traffic to a particular node. The probe periodically checks an endpoint on each node to determine whether or not the node is responding. If the probe fails to receive a response after a configured number of times, the load balancer stops sending traffic to that node. 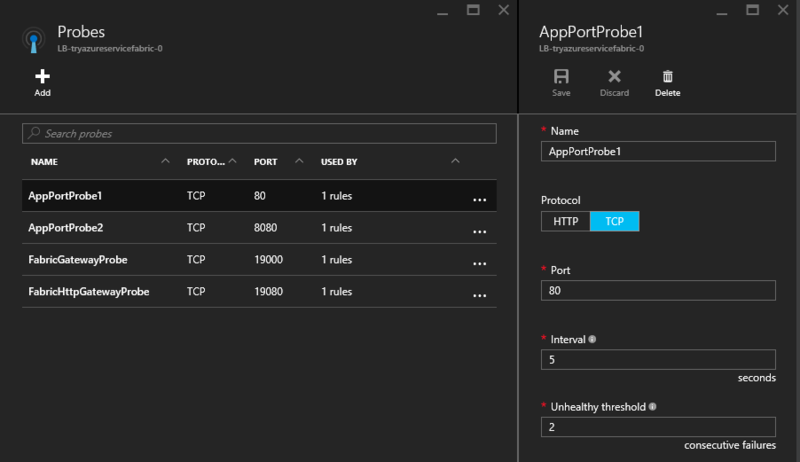 When creating a cluster through the Azure portal, a probe is automatically set up for each custom endpoint port that was configured. It's important to remember that the Azure Load Balancer and the probe only know about the nodes, not the services running on the nodes. 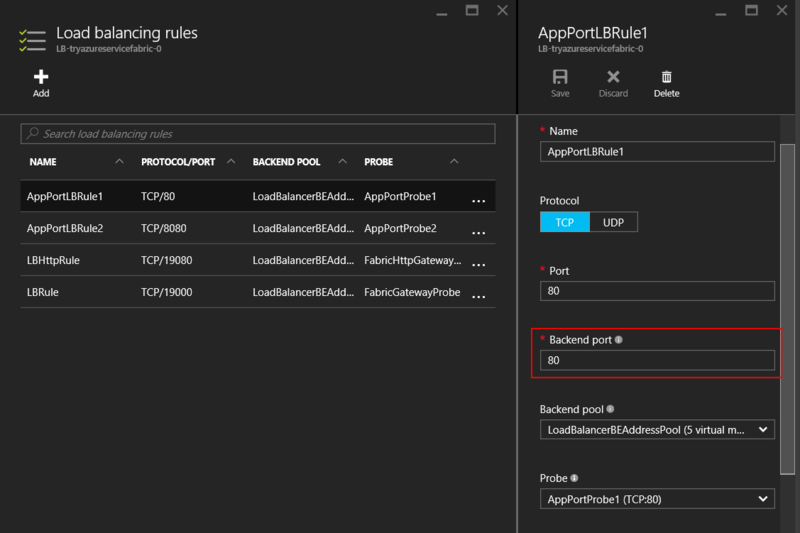 The Azure Load Balancer will always send traffic to nodes that respond to the probe, so care must be taken to ensure services are available on the nodes that are able to respond to the probe. The Reliable Services framework ships with several pre-built communication options. The decision about which one will work best for you depends on the choice of the programming model, the communication framework, and the programming language that your services are written in. No specific protocol: If you don't have a particular choice of communication framework, but you want to get something up and running quickly, then the ideal option for you is service remoting, which allows strongly-typed remote procedure calls for Reliable Services and Reliable Actors. This is the easiest and fastest way to get started with service communication. Service remoting handles resolution of service addresses, connection, retry, and error handling. This is available for both C# and Java applications. HTTP: For language-agnostic communication, HTTP provides an industry-standard choice with tools and HTTP servers available in many different languages, all supported by Service Fabric. Services can use any HTTP stack available, including ASP.NET Web API for C# applications. Clients written in C# can leverage the ICommunicationClient and ServicePartitionClient classes, whereas for Java, use the CommunicationClient and FabricServicePartitionClient classes, for service resolution, HTTP connections, and retry loops. WCF: If you have existing code that uses WCF as your communication framework, then you can use the WcfCommunicationListener for the server side and WcfCommunicationClient and ServicePartitionClient classes for the client. This however is only available for C# applications on Windows based clusters. For more details, see this article about WCF-based implementation of the communication stack. Services can use any protocol or framework for communication, whether its a custom binary protocol over TCP sockets, or streaming events through Azure Event Hubs or Azure IoT Hub. Service Fabric provides communication APIs that you can plug your communication stack into, while all the work to discover and connect is abstracted from you. See this article about the Reliable Service communication model for more details. Learn more about the concepts and APIs available in the Reliable Services communication model, then get started quickly with service remoting or go in-depth to learn how to write a communication listener using Web API with OWIN self-host.